The Most Romantic Bed and Breakfast in Texas! Lockheart Gables Romantic Bed and Breakfast is the perfect romantic destination for a Romantic Getaway, Honeymoon, Anniversary, Birthday or any special trip to Fort Worth. Each of our six fabulous king suites features heart-shaped, jetted tubs for two, with prices ranging from $206-$235 per night, plus tax. Each suite is adorned with candles to set the tone for your romantic night, and a lighter is provided. A variety of snacks are available to our guests, including gluten-free options. A fridge is provided which contains complimentary sodas and water for our guests. Breakfast is served in-room, and the breakfast table can also be used to bring in your own dinner. Plates, silverware and wine glasses are also provided. As a romantic destination, this is an ADULTS ONLY facility. There are no accommodations for children. 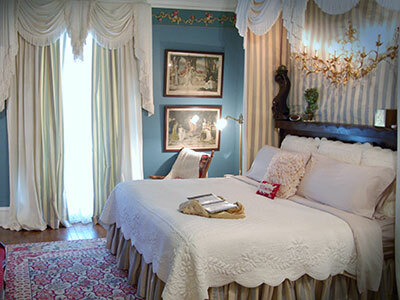 We invite you to make a memory at Lockheart Gables Romantic B&B, a Fort Worth Bed and Breakfast! Prices range from $206 (inside mansion suites) to $235 (cottages) per night plus tax, with weekday and other discounts. You are welcome to book directly, using the link at the right, or call us to make your reservation. 817-738-5969 or 1-888-22-HEART. We will be delighted to serve you. Our check-in time is from 4-6 pm. There is no front desk, so the time you select to arrive is very important. If you need to arrive after 6 pm, please call us to arrange a time to come by for a pre-check in. There are unique aspects to each suite that we will show you, and we will gather breakfast preferences from you in order to personalize your experience. Proof required. Discount will be applied at check-in. Lockheart Gables has six fabulous king suites. Each suite is equipped with a heart-shaped tub large enough for two. Fresh flowers and plenty of candles create the perfect romantic atmosphere. A beautiful, intimate location for Dallas/Fort Worth area weddings. The Garden can accommodate up to 150 guests. Included in each package is the honeymoon suite of your choice. Surprise, pamper and delight your beloved with special add-on's to enhance your stay. 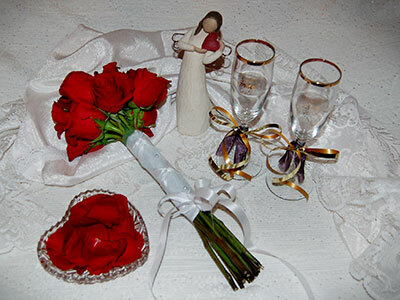 Items such as roses or sparkling cider will be placed in your suite shortly before your scheduled arrival.